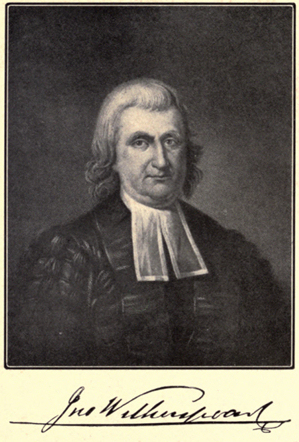 WITHERSPOON'S life is notable in connection with four important movements: the struggle for popular rights in the Church of Scotland; the administration of Princeton College; the organization of the American Presbyterian Church; and the American Revolution. I have tried to tell the story of his life simply and accurately. As I have avoided the use of foot-notes I shall indicate here the sources of my information. For the Scotch period these were Cunningham's "History of Scotland," "Auto-biography of Rev. Alexander Carlyle," and the Minutes of the General Assembly; for the American period, Bancroft's "History of the United States," "Sprague's Annals," Sanderson's "Lives of the Signers of the Declaration of Independence," Tyler's " Literary History of the American Revolution," McLean's "History of the College of New Jersey," John Adams' Diary, the Writings of Washington. But in all cases I have also used the original documents. These are the minutes of the Board of Trustees of Princeton College, the minutes of the Presbytery of New Brunswick, of the Synod of New York and Philadelphia, and the records of the Presbyterian Church; the minutes of the Provincial Congress and Council of Safety of New Jersey; the Secret Journals of Congress; Thompson's Journal; Wharton's edition of the "Diplomatic Correspondence of the American Revolution." For both periods I have used the American edition of Witherspoon's Works, my own collection of his manuscripts, and letters found in various publications. I here express, also, my grateful appreciation of many courtesies extended to me by the librarians of Princeton University and Theological Seminary and Pennsylvania College; by the historical societies of New Jersey and Pennsylvania, and by the state librarians of these commonwealths. I am also indebted to the late Senator M. S. Quay for printed copies of government documents.